There are various methods to enter attribute data to the attached database (DBF file). 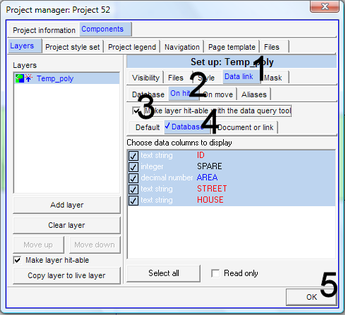 A) If only one feature of one item is to be edited: In live layer mode, with attribute file linked > Edit-tool (at toolbar left) > Select the feature > Data > Enter data > OK. Don't forget to save. C) You can also enter attribute data at the database level of Map Maker, as explained in Chapter 4.2: Main menu > Utilities > Database utilities > Edit database > Select folder and DBF file. In this mode, you can edit column (fields) or rows (records). Be aware, that it will save only through the Save as … option into a new file. 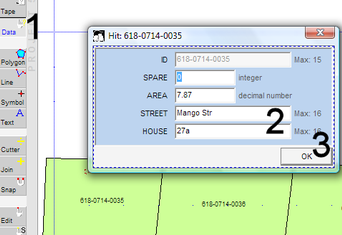 D) You can also enter attribute data outside the live layer mode. E) 1. Load the DBF file in Excel and edit it there. Keep the header row and the left column untouched, but you can add columns. Format all entries either as text or numbers. 2. After editing, save it as an XLS file. 5. Save as usual, including the DBF file.